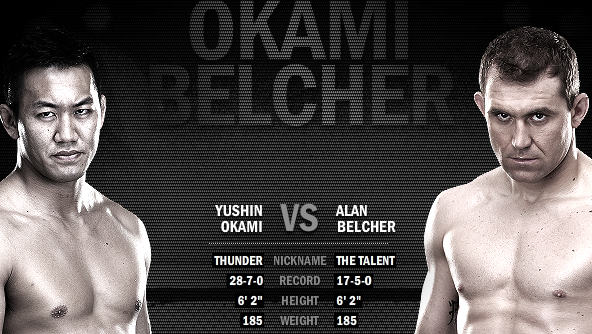 In a featured Middleweight bout, Yushin “Thunder” Okami and Alan “The Talent” Belcher will meet for the second time. Their first fight, all the way back in 2006, ended with a fairly one-sided decision for Okami. Has Belcher grown enough as a fighter to even the series, or will Okami control him with superior size and physicality? Alan “The Talent” Belcher is a versatile, dangerous Middleweight who is currently riding a four fight win streak. Not many other 185 pounders in the UFC have Belcher’s ability to end fights with strikes or submissions. He’s a solid wrestler with a strong top game and heavy, accurate punching. Against Okami, he will definitely be the smaller and less powerful fighter. He’s going to have to try to use his footwork to keep Okami at range where he can outbox him. If he allows Okami to clinch, he is going to have to fight off his back, because Okami has very dangerous leg trips from the clinch. Yushin “Thunder” Okami, although a loser in two of his last three fights, has clearly established himself as one of the UFC’s top Middleweights over the last few years. He’s a very big Middleweight with great takedowns and excellent trips from the clinch. His boxing isn’t world-class but it is very technically solid and he has decent punching power. He’s most dangerous from top position, though. He uses his size very well to control opponents, and can do a lot of damage with ground and pound. If Belcher can keep Okami from getting in close or taking him down, he definitely has good enough striking to win this fight. Keeping Okami from getting in close is a tall order, unfortunately. I don’t see a way for Belcher to stop Okami from bullying him into the fence, boxing from the clinch, and setting up those leg trips. Okami will outmuscle Belcher for another one-sided decision. Prediction: Yushin Okami by Decision.